A man is asleep on the knees of a woman who holds scissors in her hand and is about to cut his hair. The woman is Delilah, Samson’s mistress. Samson has a tremendous strength that he uses against the Philistines. Delilah, who belongs to this people, has promised them to find the cause of this strength. And Samson has just revealed that no razor has ever passed on his head because he is nazir, that is to say dedicated to God, and it is the latter who gives him his strength. Samson can also sleep in a bed only, near Delilah. The latter is sometimes undressed but, whether she is naked or dressed, everything indicates they are lovers. Delilah cuts his hair or else, once she has committed the act, she makes a sign to the hidden men who rush into the room to bind Samson hand and foot. Samson’s strength is gigantic. After many adventures, he has just pulled up the gates of the city of Gaza and carried them away on his back. Since"he loves a woman in the valley of Sorek, whose name is Delilah" , the Philistines decide to pay her so that she should tell them the secret of his strength. Delilah says to Samson: "Tell me, I pray you, where your great strength lies, and with what you might be bound to afflict you." Three times, Samson gives her wrong. And she said to him, "How can you say, I love you, when your heart is not with me? …" he told her all his heart, and said unto her: "No razor has ever come upon my head; for I have been a Nazarite to God from my mother's womb: if I am shaven, then my strength will go from me, and I shall become weak, and be like any other man…." This betrayal shows one must distrust foreign women but it also symbolizes sensual pleasure prevailing over male strength. 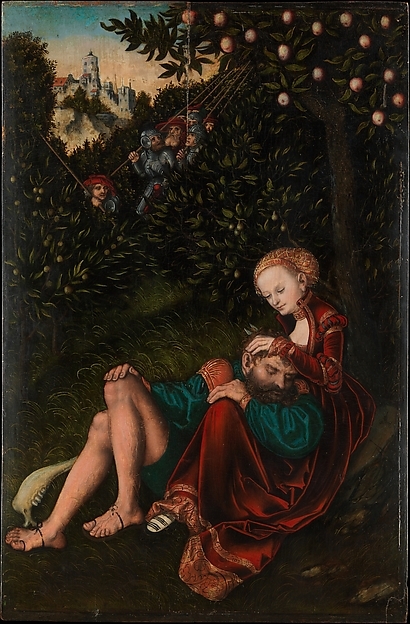 An intimate scene with the two lovers. 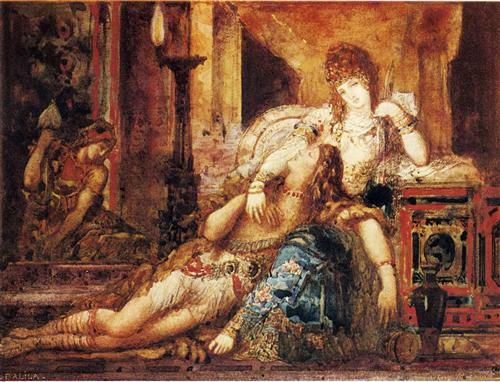 Samson and Delilah; Gustave MOREAU; 1881-1882 ; watercolour; Musée du Louvre, Paris. The Philistines rush on Samson; Delilah’s betrayal is blatant. Samson and Delilah; Ludovicus FINSON; c. 1610; oil on canvas; Musée des Beaux-Arts, Marseille, France.